I am a skin care fanatic! Seriously. Once I hit about 24 I became obsessed with sunscreen and skin creams and skin care in general. I think it's because that was when I noticed my first tiny wrinkle and realized that my face wasn't gonna stay young forever. And I better get serious about taking good care of it. You see, I had been a lifeguard every summer since I was 19 and I FINALLY started realizing that the sun was NOT a good thing for my skin and I needed to start repairing the damage I had already done and prevent future damage. I've tried a ton of facial skin products in my quest to find the best, so I was very excited to review Sibu Beauty. 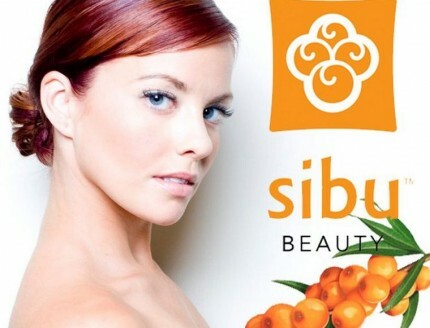 Sibu Beauty is a premium skin care products made from the Himalayan sea buckthorn berry. Known as the “beauty berry” across Europe and Asia, sea buckthorn contains over 190 bioactive compounds that restore, revitalize, and protect youthful beauty – from the inside-out AND outside-in. These hardy berries help nourish skin, hair, and nails with powerful antioxidants and essential fatty acids, including the rare Omega 7 – a key building block to healthy skin, hair, and nails, and also aids digestion and may help you maintain a healthier weight. Sibu Beauty features luxurious natural skin cleansers, moisturizes, and other topical treatments as well as dietary supplements that beautify and protect from the inside-out. Sibu Beauty generously sent me the Nourishing Facial Cream, Age Defying Eye Cream, Facial Cleanser, and the Purifying Mask for review. Let's start with the Facial Cleanser. This cleanser was really nice. It has a light citrusy smell, which I like. It is so important to have a good cleanser- it's the foundation of your skin care regime. This cleanser gently removes dirt, impurities and make-up while maintaining a healthy balance in your skin without compromising its natural protective nutrients. It is lightly exfoliating and leaves your face feeling fresh, clean, and perfectly balanced. It left my skin feeling soft and clean. This cleanser doesn't foam up. You just work it into a lather, and gently massage onto your face and neck. Then, rinse thoroughly with lukewarm water. Next up is the Purifying Mask. The sea buckthorn purifying mask has omega 7 fatty acids and deep cleans pores while purifying skin. With sea buckthorn, detoxifying clays, exfoliating enzymes and shea butter, this multi-functional mask is ideal for weekly use. You shouldn't use it on the same day as a exfoliating scrub. You apply the mask in a thin layer on your face and leave it on for 5-7 minutes. After I washed this off with warm water it left my face with a tingly feeling, but a good kind of tingle. Like the, "Oooh, my face feels clean and refreshed" kind of tingle. Plus, my face was super soft due to the exfoliating. This reminded me of the kind of masks you get during a facial. A real treat for your face once a week! This was my favorite product that I reviewed. The Nourishing Facial Cream also has a light citrus smell. It includes omega 7 fatty acids, and creates the perfect barrier to moisturize, rejuvenate, repair and protect. This cream is really light and non-greasy. It's ideal for daily use. It is paraben-free and cruelty-free, and contains NO dairy, yeast, wheat, gluten, sodium or preservatives. This cream helps to rejuvenate sun damaged skin, protect against the environment, and preserve a healthy skin tone and texture. The only thing I wish this cream had was a sunscreen included. So, keep in mind that you still need to use a moisturizer with sunscreen every morning as well to help protect your skin from future sun damage. Last up is the Age Defying Eye Cream. The age defying eye cream is an all natural formula, specifically designed to gently support the delicate eye area. The time-tested plant oils of sea buckthorn and pumpkin seed, protect and firm the skin while refining fine lines. This botanical blend will leave the skin around your eyes feeling soft, smooth and youthful. This cream is suitable for all skin types. The cream was really light and doesn't really have a smell. I used it morning and night for the last two weeks. It definitely left the skin around my eyes feeling smooth and soft. I haven't noticed a huge difference in the fine line around my eyes, but I think that you have to give any skin product a minimum of 4 weeks to truly tell whether they are making a real difference. All in all, I was really happy with Sibu Beauty's products. I would purchase these in the future- especially the purifying mask. They are a fraction of the price of more expensive brands and have provided me with similar experiences as when I have used those other skin care products. Follow & Connect: You can like Sibu Beauty on Facebook, follow them on Twitter, and follow them on Pinterest. You can also join their newsletter. Buy It: You can buy all the products: Facial Cleanser $17.95, Purifying Mask $29.95, Facial Cream $20.95, Eye Cream $24.95 on the Sibu Beauty website. Win It: Come back Monday, April 9th for a chance to win the Sibu Beauty Facial Cleanser and Facial Cream in the Don't You Look Marvelous Blog Hop! I love any facial product with a citrus-y smell. And it is a bonus that this is all-natural! Nice review, I have the Nourishing Facial Cream and I love it! I have heard so many wonderful things about Sibu Beauty. Thanks for the review. I would also like to try the purifying mask. The products sound great! I am a current Sibu user. Love all of their products. My skin feels like silk now. I keep telling my husband I do not know what I did before using Sibu! Though I have heard and seen this product name I have yet to try it! I love your review and the information that you passed on! thanks! These products sound great, I so want to try the Purifying Mask.